When using a dry vacuum pump, you may wish to clean the exhaust resulting from the plasma process. This is possible with a Plasma Exhaust Cleaning Device patented by Diener. For the different plasma systems there are suitable maintenance-free dry vacuum pumps, such as root or screw pumps, used in order to accomplish plasma processes. During operation it is possible that residue can build up in void spaces in these pumps, which can limit its function. The Plasma Exhaust Cleaning Device, developed and patented by Diener, cleans the void spaces, protecting your dry pump. This added feature extends the lifetime of your pump and helps guarantee results. 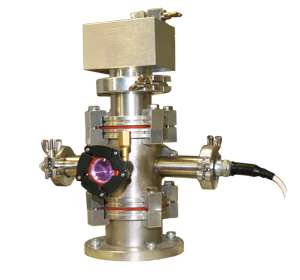 The Plasma Exhaust Cleaning Device functions by using an electrode in or attached to the void space of the pump, which creates plasma. Process gases then flow into and out of this space which removes and avoids contamination. Please contact us for details and questions you have.